Not too many people on the Square being a weekday I guess. It is an attraction in itself, beautiful architecture. We have not even started our journey eh. And so we reached the hotel. It is not cheap to my standard but the cheapest in their catalogue. It is simple and convenient. The only thing that I am not used to, is that some units (including ours) shares toilet and bathroom. In my years of travelling, this is my first encounter with a common washroom and I believe will be the last. On a positive side, the hotel staff are courteous. No complain whatsoever at the duration of my stay. The first thing I did on that day? Go walk to the Tourism Office and inquired on the city tour, canal tour and our bus tour to Sweden. Regarding the city tour, I did not make a booking because some of the main attractions are close to my hotel. Though I made reservations for the canal tour and the bus adventure to Sweden. i have to commend the staff at the Tourism Office. They are all pretty cool. They treat their prospective clients fairly. No discrimination. First come, first served. My observation on the street? I find no untoward incident on our walk in and around the city centre. I can see on the road the happy faces of the locals who are lined up with their bicycles waiting for the GO traffic lights. It is nice to see how disciplined they are. They are so relaxed and I see no cars run fast the required speed. The Danes use bicycle most of the time. I guess this is the transport in going to work and in running errands. Saving gas is saving money. Good decision! This is how cool the Danes are. Simple life and low expectation. No fancy things and human beings. On that very first day, I have observed part of Copenhagen. The people, culture and their life in general. We pass by the Tivoli Gardens. The Disneyland of Copenhagen and a 'must see' in this beautiful city. An amusement park in its own right and is just one of the most popular destinations in the city. So, don't miss it especially if you are with your kids. Enjoy the rides full of fun and entertainment for all ages. The information below will help you decide when and how to go to Tivoli. Make sure you check their website for Opening dates and time. For year 2019, winter in Tivoli is from February 1 to 24. See the information in their website. I will share it with you though. That's about it for the first day - the city square, tivoli and the local people. Day two is the busiest day. Now, let's start the walking. Our first stop is Copenhagen's City Hall Square and the Tivoli Gardens which I already had a glimpse the day before. Spend at least half an hour taking pictures and enjoy the view on the square with the Tivoli Gardens at the background. There are many people this morning, mostly tourist I believe. Looks like this is the best meeting place for the local tour guides and tourists. That's what I am seeing right now, a group of foreigners with tour guides explaining what to expect. They are all around the Square. We then walk along with other tourists and admire the medieval Amagertov and the Christiansborg Palace. 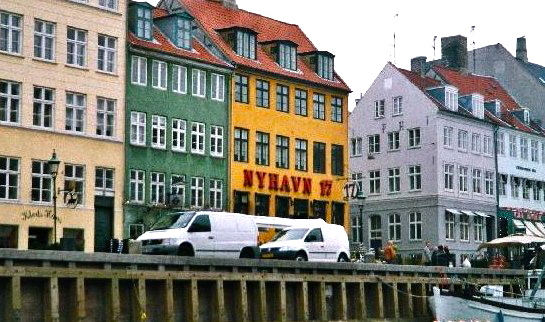 We then proceed to the coloured houses of Nyhavn at the canal district. Very beautiful! It is an amazing experience seeing for the first time the ever popular Nyhavn which means " New Port" or " New Harbour". In the area, you will be treated for a fine dining at various restaurants and have your favourite drinks at pubs and cafes linked up on the street beside the canal. The place is full of life all night long, twenty-four hours a day. Find out for a Canal Tour that you can book in the area. I had the DFDS Canal Tour that takes you through the harbour and the idyllic canals of Copenhagen. You will receive information about the most beautiful churches, castles, the picturesque old houses and some of the interesting new buildings and exceptional sights like Little Mermaid, the Opera & Holmen Island. I have a memorable tour of the canal as our lady tour guide is articulate and have given clear description in three different languages, Danish, German and English. She is very professional and possess a pleasant personality. 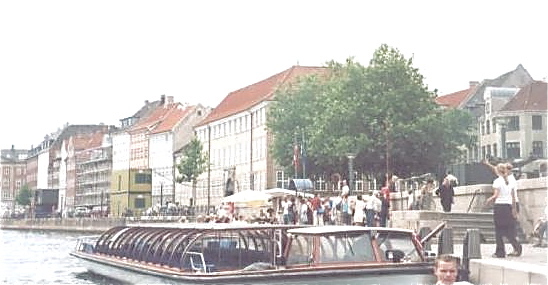 You may also make reservation for this canal tour through Tourist Information Office in the centre of Copenhagen. Continue walking and this time to see the fairytale statue of the Little Mermaid. I am a bit disappointed because she is too small contrary to my expectation though it looks like the most photographed tourist attraction in the city. 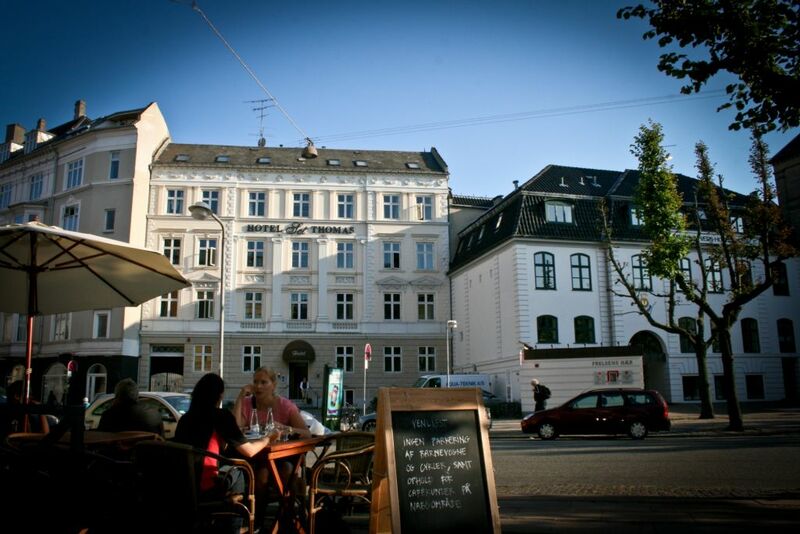 To me, it is still the memory of Copenhagen, so there is no regret. Below are information that I am sure you need. You must see the Lille Havrue, otherwise, you can not say that you did see the best of Copenhagen. For whatever reason, we reached the place where we found the 'Slægt Løfter Slægt". I really don't remember how, but just by walking. I did not know anything about this statue not until now. 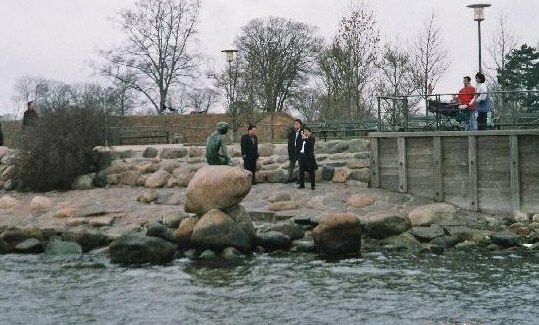 A unique sculpture which the Danes call as such. 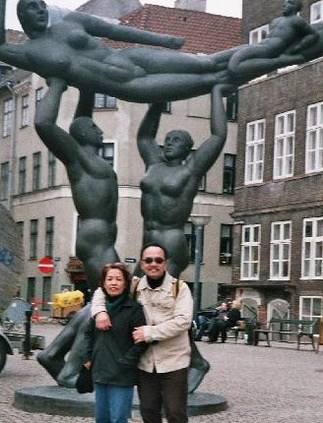 It is so interesting that I did not miss taking photos of me and my family with the bronze statues at the background. To give you an idea, this was sculpted by S.W. Hansen in the year 2000. It is, or they are tall with a height of 500 centimetres. The Slægt Løfter Slægt is located in the historical Gammel Strand, one of the oldest harbour in Copenhagen. Come here in summertime. You will find a long line of restaurants and open-air cafes at this season of the year. I already mentioned earlier about the bicycles that the locals use as their means of transportation. You will see them parked near the train central station. 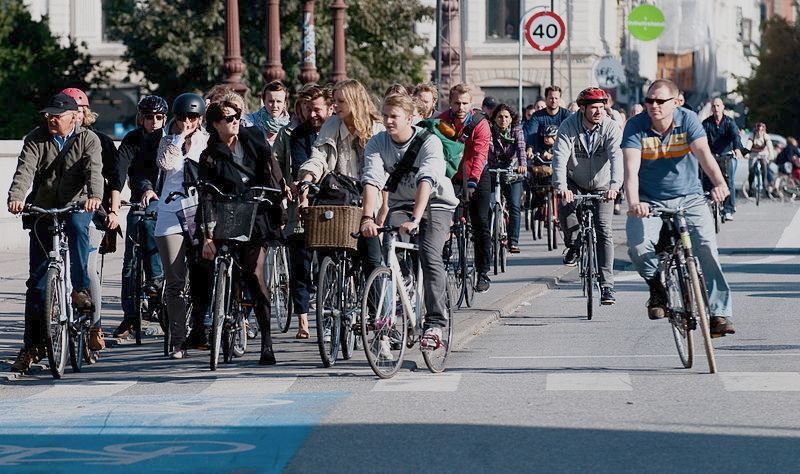 There are far too many of this scene all over Copenhagen. Danes like bikes. And they park their bicycles in the designated parking areas. It is part of their daily lives. I am amazed on how they behave on the road, how they stop on the stop signs and start moving their bikes like waves on green lights. I can see bikes on the road adorned with baskets decorated with flowers, vines and what have you. So cool, isn't it? The third day is a bus tour of Malmo in Sweden. It is a whole day tour that I will also blog about. As soon as I am done with the tour, I will post a link for you to check out what will gonna happen. The story on Denmark will end now. I will give 98% for all I have seen in Copenhagen. That is one of the highest rate I ever done so far. I am sure of my review. Copenhagen is priceless!